I arrived at the trailhead on Tower Rd, a dirt road near the top of a hill and a radio tower (hence the name of the road) and parked on the wide shoulder of the road. The sky was now completely darkened by clouds and the wind was whipping the leaves on the trees. Rain began to dot my windshield. I pulled out my cell phone and checked the weather radar and saw that there was a band of rain showers moving through. I decided to wait it out and sat impatiently in my car for about 30 minutes constantly checking my phone for the updated weather radar. The rain had finally passed, but it was still cloudy and gray, and still quite windy; the wind made it feel that much more bitter. I had checked the temperature while I was waiting and it was in the low 40s with wind-chills in the 30s. I thought about giving up, skipping the hike, and heading home, but I had taken the day off work and was determined to get a fall hike. So I started out, I was wearing several layers and had pulled on a knit hat and gloves to keep warm. (mile 0.0 – 8:19 am) The trail curled its way past the radio tower at the top of the hill and headed back down to cross Tower Rd a little north of where I had parked. Soon after the trail crossed Cayutaville Rd and continued on. I crossed through a right-of-way for a power line between Cayutaville Rd and Griffin Rd. The clouds were still thick and the wind was still blowing, thankfully the wind was not much of an issue in the woods. 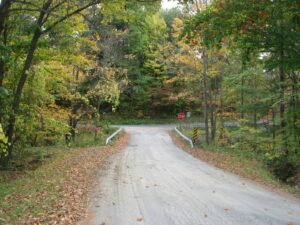 The trail turned on to Griffin Rd (mile 1.4 – 8:55 am) and continued following the road. I took a moment to snap a photo of the fall colors against the gray sky; it almost seemed to make the colors more vivid. Griffin Rd came down a slight hill to connect onto Connecticut Hill Rd (mile 2.0 – 9:10 am). I initially turned to the right on Connecticut Hill Rd, but quickly realized that the trail didn’t go that way and turned back. I soon saw a white blaze on a tree and knew I was again heading in the right direction. Some fields began to open up on the left side of the road heading up hill and shortly after a field opened up on the other side granting a nice view. The wind was still blowing, but would ease every now and then and it would become very quite. I heard a crow or two make some lonely “caws” and saw a solitary hawk circling high overhead. And then the wind would pick up again and all I could hear was the rushing sound as it blew across the fields and through the trees. I reached a “T” junction with Rumsey Hill Rd and turned to the right and headed downhill (mile 2.5 – 9:21 am). As I walked down the road the sun broke through the clouds for a brief moment and as it did a number of birds began to chirp and sing. The sun quickly went back behind the clouds again and the birds took to warmer places. I passed an empty field on the left and I thought that it seemed as though it were ready and waiting for winter snows to blanket it. Rumsey Hill Rd ended at another “T” junction with Trumbulls Corners Rd and the trail turned left (mile 3.0 – 9:36 am). I walked on and now I could hear the bubbling of a small stream on my left. I soon crossed the stream and found an FLT sign directing me off the road and into Stevenson Forest Preserve (mile 3.3 – 9:43 am). A short distance off the road was a kiosk with a map of the preserve. The trail was wide and easy to follow and made its way along another creek. After a short walk the trail turned away from the creek and headed uphill. There was a fallen tree here that made a good rest spot and I had a quick snack and a drink before continuing up the trail. I found the blue markings of a spur trail not long after my rest break (mile 3.65 – 10:07 am). I had checked the maps and knew that it was only a short spur, only about 0.3 miles, and that there was a scenic viewpoint at the end. So I hiked out to the end; it was a nice view, but the gray skies still dominated. I spent long enough to take a picture and headed back to the main trail. As I walked through the quiet pine forest of the preserve the sun once again tried to break through and cast speckled shadows down through the trees. The trail ended on Trumbulls Corners Rd a little further to the east from where I had entered earlier. It continued on over a bridge and then took an odd turn back into the woods at the side of the road. 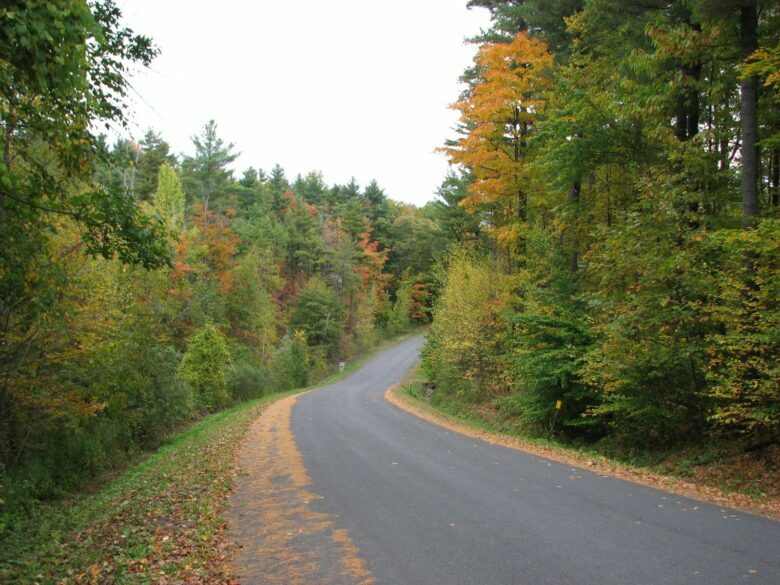 It never lost sight of the road and after a short distance came back on to the road. The blazes then turned up Porter Hill Rd for a good climb (mile 5.0 – 10:47 am) . A few houses were on my right and fields opened up to the left. They sky was getting darker and the wind was picking up again. 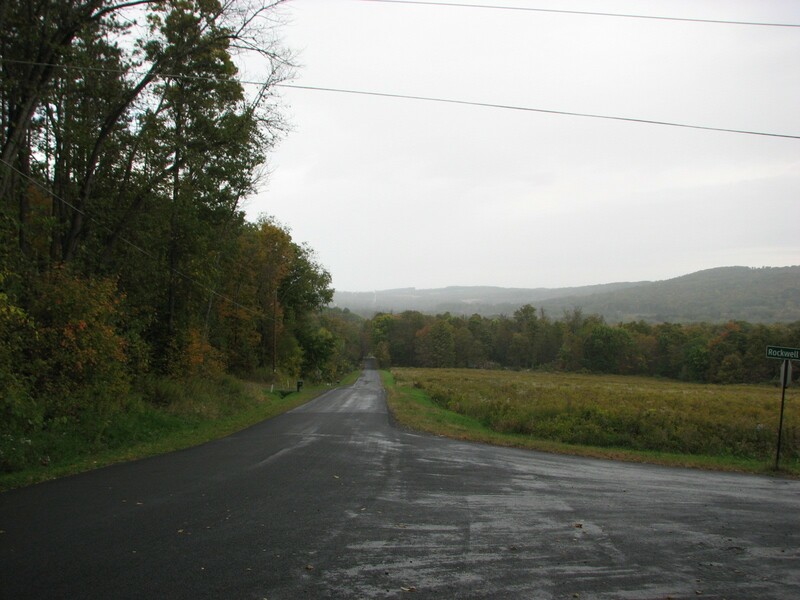 About halfway up the road it began to rain, a cold and biting rain. I slogged on finally reaching the cover of trees at the corner of Porter Hill Rd and Rockwell Rd. The trail now turned off the road and began a steep climb (mile 5.5 – 10:58 am). At the top the trail curled around and I saw a sign, “Rieman Woods”; the land had been acquired for the Cayuga Trails Club. There was a small camp area near the sign with a stone fire ring. The trail once again descended and crossed Porter Hill Rd. Here I found a hand-drawn map of the Bock-Harvey Forest Preserve. 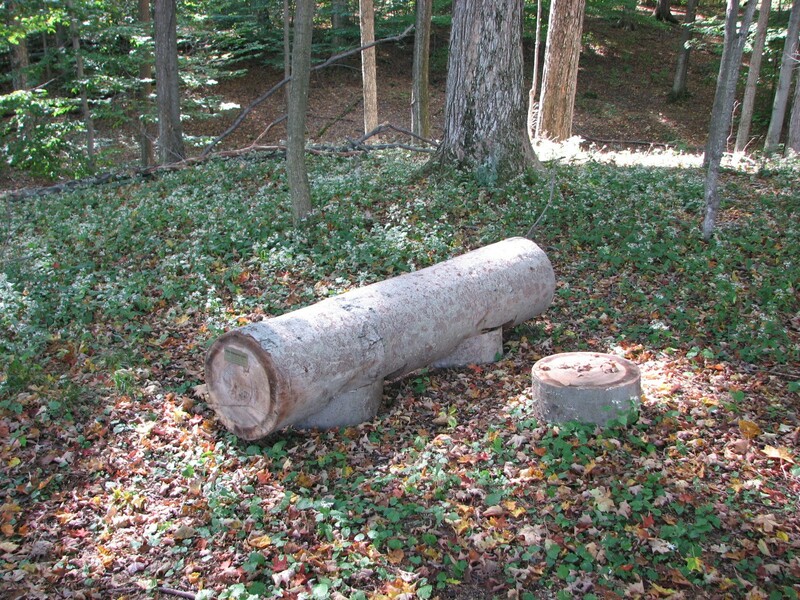 It showed a spur trail and a loop that ran through some old growth forest – maple trees 200 – 400 years old. As I continued on through the preserve I passed near a field and finally saw some blue sky, maybe the clouds were finally breaking up. I was nearing the end of the old growth forest and saw a sign that the land owner ahead had decided to close the property to the FLT (mile 6.6 – 11:32 am). The sign directed hikers over to the loop and down to Rockwell Rd. 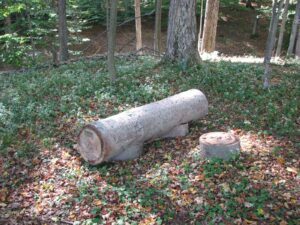 I followed the new path and found the “Ponder Log” I took a picture, but did not stop to ponder; the sun was out now and it was warming up and I wanted to keep moving. I passed by more fields and saw a hawk again circling overhead, and managed to capture a picture. The trail came out on Rockwell Rd and turned right following the road (mile 7.1 – 11:48 am) . I looked to my left and saw the corner of Rockwell Rd and Porter Rd where I had sheltered under some trees earlier while it was raining. The trail continued to follow Rockwell Rd and I passed by “Pinecreek Campground”. This late in the year there were only a few people camping. Rockwell Rd came to Hines Rd and the trail turned right on to Hines Rd. (mile 7.8 – 12:03 pm). The road passed in front of a rather large house; it looked like a barn that someone was in the process of turning into a house. There was a massive rock wall all along the front. The FLT turns and passes through an opening in the wall further up. I had come out to Hines Rd on a previous hike, so I had reached my turn-around. I stopped and took my pack off and had some water and a snack and then started heading back. The sun was now out and the sky was a bright blue and it was warming up. 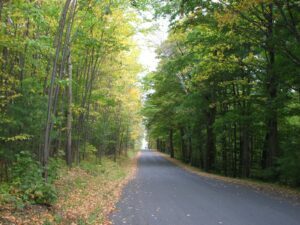 I headed back down Hines Rd to Rockwell Rd and then past the campground. I continued on up Rockwell Rd and turned back into the Bock-Harvey Forest Preserve. I decided to deviate a little and took the blue spur path I had seen on the map earlier. It indicated some benches and a view. I found the benches at the top of a field and happily took my pack off and sat down (mile 9.3 – 12:44 pm). I pulled my lunch out and enjoyed a nice view and some relaxation in the warm sun. It was time to move again and I pulled my pack back on and headed on up the trail. 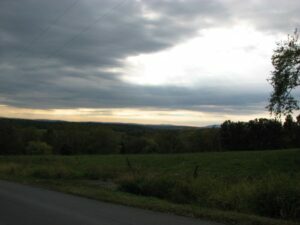 I crossed over Porter Hill Rd (mile 9.6 – 1:24 pm) and stopped to take a picture of the map now that the weather was better. I continued up the hill and past the camp site in Rieman Woods and then back down the steep descent to Porter Hill Rd again. 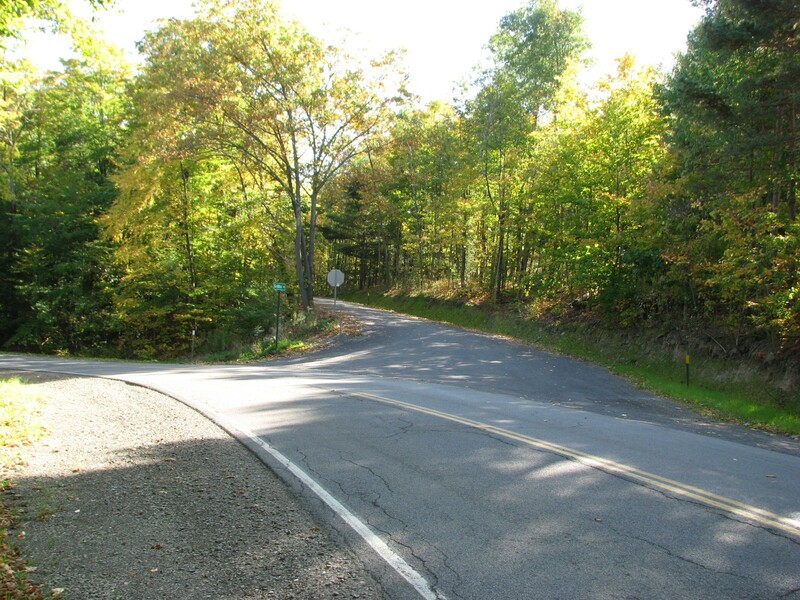 I headed back down Porter Hill Rd and got to the junction of Rockwell Rd (mile 10.2 – 1:40 pm). I looked down the road and could see where I had turned into the Bock-Harvey Forest Preserve. I took a picture as I had earlier when I had stopped to shelter under the tree against the rain. What a difference a few hours can make; then it had been raining and dark and cold, now it was warm and sunny. 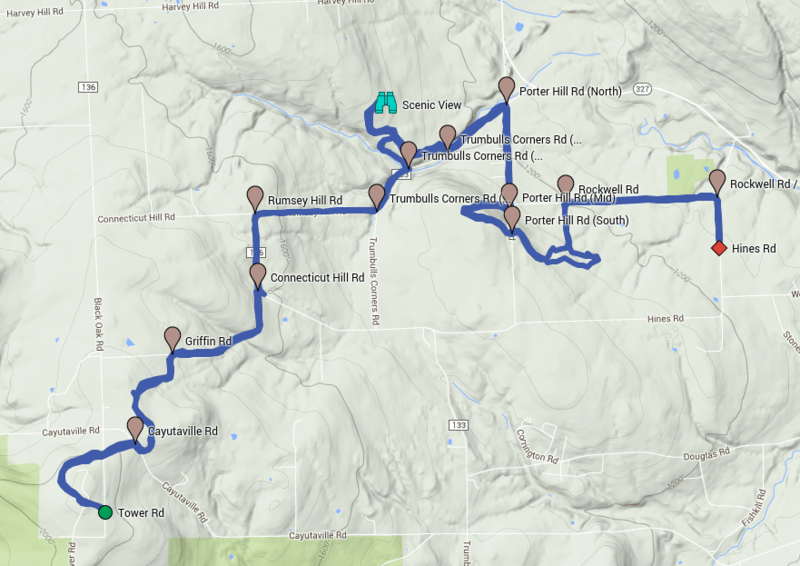 I continued on down Porter Hill Rd to Trumbulls Corners Rd and turned left. Once again I puzzled about the little jog the trail made into the woods at the side of the road, only to hop back out on the road again. Soon I was back at Stevenson Forest Preserve and headed back up the trail. And once again I took the spur trail out to the scenic view (mile 11.7 – 2:19 pm). This time I stopped and took the opportunity to change into shorts; it had gotten quite warm. I had taken off both my fleece windbreaker and long-sleeved shirt much earlier. I also took some photos and had some water before continuing on. I came back out of the preserve and continued on up Trumbulls Corners Rd until I reached Rumsey Hill Rd. 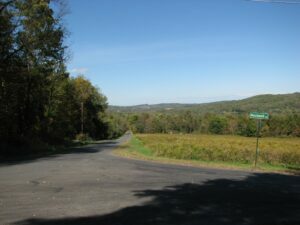 I turned up the road, passed the empty fields and on up to the junction with Connecticut Hill Rd (mile 13.2 – 3:02 pm). How different it was now compared to earlier. 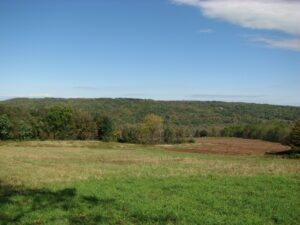 I continued along Connecticut Hill Rd, taking a few pictures of the fields along the road, until I came to the turn-off for Griffin Rd and continued on. Finally reaching the trailhead on Griffin Rd and leaving the road (mile 14.2 – 3:25 pm). I crossed over the power line right-of-way and on to Cayutaville Rd. The trail continued on up around the top of the hill and past the tower. I knew I was almost back to my car when I finally stopped climbing and saw the tower. It was an easy walk from here and soon the trail began to descend slightly towards Tower Rd. As I neared the road I could see the sunlight shining off the windshield of my car. I made it! (mile 16.35 – 4:09 pm) I took my pack off, took my boots off and packed everything away. I started my car and rolled the windows down and enjoyed the warm autumn air as I drove home.